New research from PathoGenetix, Inc. demonstrates the use of its Genome Sequence Scanning technology to confirm and strain type pathogenic E. coli and Listeria bacteria directly from complex food samples, and to reliably determine if the most dangerous serotypes of these foodborne pathogens are present. The research was presented at the American Society for Microbiology (ASM) General Meeting this week in Boston. The two posters add to a large body of PathoGenetix and independent research demonstrating the capabilities of the GSS technology in providing rapid, culture independent pathogen subtyping and serotype determination from complex biological samples. PathoGenetix™ Inc., a commercial-stage developer of an automated system for rapid bacterial identification, presented new research this week demonstrating the use of its Genome Sequence Scanning™ (GSS™) technology to confirm and strain type pathogenic bacteria. The research shows that GSS could be used to identify foodborne pathogens of increasing concern in food safety, in one study identifying STECs (Shigatoxin-producing E. coli) serotypes with the more dangerous “virulence” genes, and in another study not only differentiating L. monocytogenes among the general Listeria species, but even identifying its strains. The study findings were detailed in two posters presented on Monday at the 2014 General Meeting of the American Society for Microbiology in Boston. The first study, entitled “Strain typing of BIG 7 STECs and differentiation from stx- and/or eae- BIG 7 serogroup E. coli by Genome Sequence Scanning” demonstrates that GSS could be used to accurately identify particular strains of pathogenic E. coli that have been identified as “adulterants” in food by the U.S. Department of Agriculture’s (USDA) Food Safety and Inspection Service (FSIS). Recent USDA-FSIS regulations require food companies to test for the presence of specific disease-causing organisms (E. coli O157:H7 and STECs of six other serogroups) in combination with certain “virulence” genes (stx+ and eae+), which when present indicate the particularly pathogenic nature of the bacteria. This research shows that GSS could be used as a confirmatory method for Big7 STEC screening assays used to test for these adulterants in food products, and reduce potential loss of product due to high false positive rates among current STEC screening tests. The second study showed that GSS provides similar insights into the structure of the Listeria species, by rapidly confirming and differentiating the pathogenic L. monocytogenes strains from nonpathogenic Listeria species. In the study, entitled “Rapid Molecular Serotyping of Listeria spp. by Genome Sequence Scanning,” GSS was used to examine a collection of 18 strains and 35 genome sequences representing five different species of Listeria. 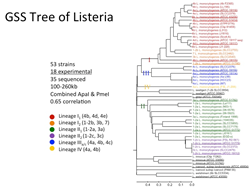 In general, the strains from the different species of Listeria were distinctly separated from each other, with strains belonging to the four major lineages of L. monocytogenes forming individual clusters with each serotype clearly distinguished. PathoGenetix, Inc., is a commercial-stage developer of an automated system for rapid bacterial identification from complex samples. PathoGenetix is a venture-backed company that has also received more than $50 million in technology development funding from the Department of Homeland Security. The company’s core Genome Sequence Scanning™ (GSS™) technology isolates and analyzes DNA directly from an enriched biological sample, without the need for a cultured isolate, and provides results in just five hours, days faster than current methods. GSS has broad applicability in food safety, industrial microbiology, and clinical diagnostics and research. The first commercial GSS system, the RESOLUTION™ Microbial Genotyping System, will be available by early 2015 for use in food safety testing and foodborne illness outbreak investigations. Learn more at http://www.pathogenetix.com.